Curtis Emerson LeMay was born on 15 November 1906 in Columbus, Ohio. LeMay studied civil engineering at Ohio State University, where he also joined the ROTC, hoping to eventually enter the Army Air Service. After graduating, LeMay joined the National Guard before being accepted into the Air Corps. In 1929, Lemay earned his wings. In 1938, LeMay was chosen to be the lead navigator for the first mass flight of B-17 Flying Fortresses in a publicity mission to Buenos Aires for the inauguration of the newly elected president of Argentina. responsibility of heading efforts to incorporate the new B29 into combat. He later took over B29 operations in China and the Pacific. In the air campaigns against Japan, LeMay abandoned the established policy of high-altitude, daylight, precision bombing. Stripping his B29s of guns, he loaded the planes with firebomb clusters and sent them out over Japanese cities at low levels, during the night. LeMay’s bombers continued this firebombing campaign for the remaining months of the war, killing some half million people and leaving some 8 million homeless. By the time the war ended, with the dropping of the atomic bombs in August 1945, LeMay had earned the rank of Major General. After World War II, LeMay served at the Headquarters Air Materiel Command and the Pentagon. In 1947, LeMay transferred to Wiesbaden, Germany to command the US Air Forces in Europe. LeMay was responsible for organizing the Berlin Airlift, which began in mid-1948 when the Soviets blockaded the city. During this time, the possibility of a war with the USSR loomed large and the US government moved to rebuild the Strategic Air Command (SAC). LeMay returned to the US in October 1948 to take charge of the SAC. Over the next ten years LeMay developed and incorporated intercontinental ballistic missile capability and oversaw rigorous training that turned SAC into an extremely powerful and effective military force. In his first war plan drawn up in 1949, LeMay proposed dropping the entire stockpile of 133 atomic bombs in one massive attack on 70 cities within 30 days. By the end of his term, the SAC was on constant alert and ready to take on an all-out atomic attack, LeMay’s so-called “Sunday punch,” at a moment’s notice. LeMay was SAC commander until June 1957, serving the longest term of any US military force commander. 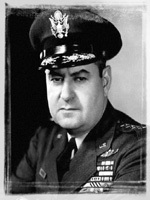 LeMay was appointed Vice Chief of Staff of the United States Air Force in 1957 and Chief of Staff in 1961. He found less success in these positions than during his service as commander of SAC. As a member of the Joint Chiefs of Staff during the Cuban Missile Crisis, LeMay advised President John F. Kennedy to take a strong, militant response to the deployment of Soviet missiles in Cuba. The President initially favored a military response, including an air strike that would have been coordinated and executed by General LeMay. However, LeMay’s tactless approach to crisis management doomed his constant pleas for military action against Cuba to be abandoned in favor of the quarantine option. In 1965, LeMay retired after a distinguished service from the Air Force. During his career, he received many awards and decorations from both the US government and foreign governments. In 1968, LeMay ran for Vice President on George Wallace's ticket. During the campaign, the press mocked him and compared him to General Jack D. Ripper from the 1964 movie "Dr. Strangelove." General Curtis Emerson LeMay died on 1 October 1990.